Ellie Britton (21) student, Backwell, North Somerset: I remember having several tick bites as a child, but never noticed a bullseye rash. When I was 10 I became too ill to go to school, and was misdiagnosed with ME/CFS. We never linked the illness and the tick bites. I’ve missed out on most of my teenage life. My worst symptoms are severe fatigue (I often need a wheelchair when leaving the house), constant nausea, stomach ache, headache, ‘brain fog’, sore throat, bone, joint and muscle pain, tremor, sensitivity to smell, light and noise. My NHS Lyme test was negative but a private test in the UK showed I had Tick Borne Encephalitis and 3 months of antibiotics were recommended. I subsequently had a number of tests in Europe and tested positive for Lyme disease. I am now travelling abroad for treatment every 3 months, which is expensive and difficult with my declining health. 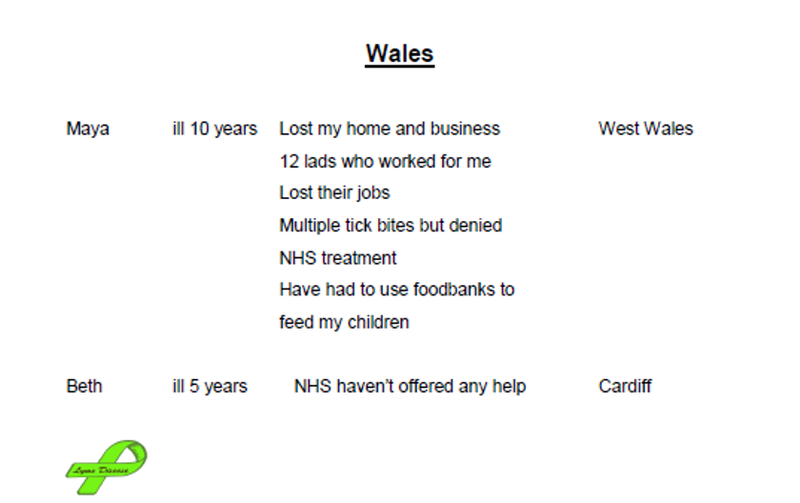 I’m currently living in Cardiff, unable to work. Billionaire, John Caudwell recently put the spotlight on Lyme Disease in the media when he and his family discovered they have this debilitating illness. On May 24th, Lady Mar will be supporting Lyme sufferers at Parliament Square in London. 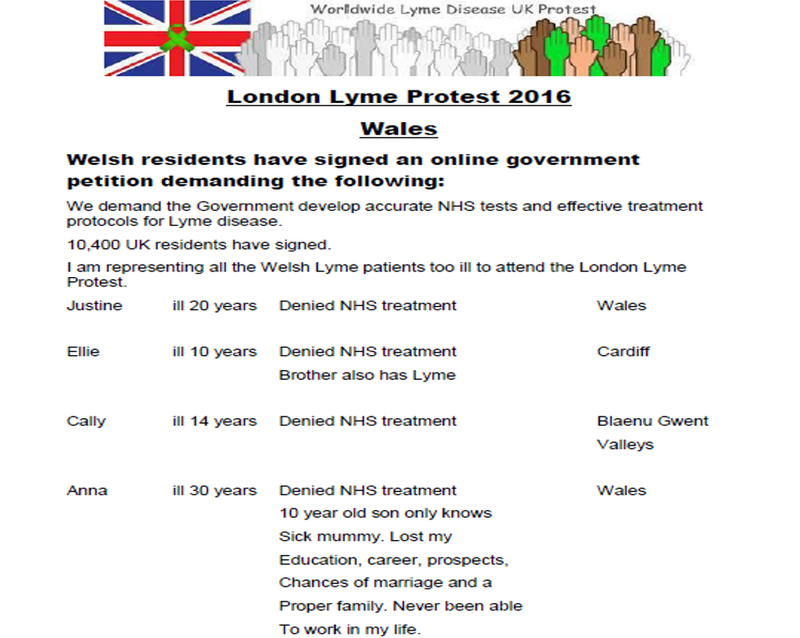 They will be protesting about the current inadequate NHS test for Lyme: poor diagnosis by GP’s and insufficient treatment for this debilitating disease. They are also calling for Lyme borreliosis to be made a Schedule 1 notifiable disease, so that the true UK incidence of Lyme is recognised. Germany has around 250,000 cases a year compared to official UK figures of around 1,000 but Lyme sufferers believe the UK is in the midst of an unrecognised epidemic with an annual incidence of Lyme borreliosis in England and Wales more likely to be between 15,000 and 30,000 cases. Lyme protests will also be taking place around the world during May in America, Scandinavia and Europe. James Prosser, police officer (37) Worcester: has no recollection of a bite but has been ill for 2 years with mainly urological infections. He had a break of 8 months with few symptoms, he then suffered cognitive and neurological problems, issues walking, tremors, crippling fatigue, constant feeling of flu. Poor memory, poor sleep. Rhiannon Collins (21) Kent: was bitten by a tick aged 4, she had a rash but was told her Lyme tests were negative and offered no treatment. At 18 she became very ill and eventually had private testing which confirmed she had had Lyme disease for 14 years. Her family discovered from medical records that her initial test at 4 years old was in fact positive but the results had ‘been lost’ by PHE. She now struggles to walk, her spine has degenerated, her joints dislocate, she has neurological problems and suffers extreme pain all day, every day. Rhiannon improved slightly after some private treatment but now her mother, Debbie is appealing for funds to take her daughter to see an expert Lyme doctor in America. Ellie Britton (21) student, Backwell, Somerset: had several ticks removed from her as a child. When she was 10 she became ill and was misdiagnosed with ME/CFS. She missed 4 years of secondary education. She now requires a wheelchair, has severe fatigue, nausea, stomach ache, headache, ‘brain fog’, sore throat, bone, joint and muscle pain, tremor, sensitivity to smell, light and noise. An NHS Lyme test was negative but a private test showed she had Tick Borne Encephalitis and positive for Lyme disease, so 3 months of antibiotics was recommended. “I have had to go to abroad for treatment as the NHS won’t help me.” Ellie is currently living in Cardiff doing an A level correspondence course. I saw an Infectious Diseases Consultant who didn’t want to give me antibiotics and wasn’t sure what to do. He also told me that Lyme goes away. I am now fundraising to go to the USA for treatment. I have 3 young children, so having Lyme is stressful.